The GX-2009 Four Gas Personal Monitor is the ultimate device for telecommunication professionals. 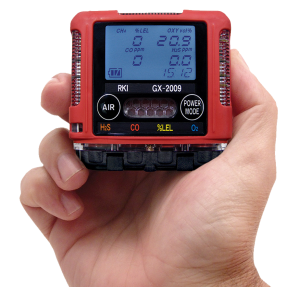 Boasting the title of the lightest & smallest four gas monitor on the market today, this detector is our most popular gas detector and unlike some other popular gas detectors the GX-2009 complies with Australian Standards. As this device is portable, the detector can be hand-held or clipped to a belt to ensure that your space is monitored appropriately. All of our instruments offer easy operation, audible and visual alarms, and have been designed to meet all safety requirements. As we are the main distributor for Riken Keiki & RKI Instruments we offer full servicing and maintenance capabilities for our customers. This ensures that when the your Telecommunication Four Gas Personal Monitor Kit is due for a service you can ensure it will be a quick process. We believe every individual should be able to afford a reliable gas detector, which is why we offer only the best price, as well as trade in and rental options.